You know how some restaurants provide crayons for the kids to color the menu? 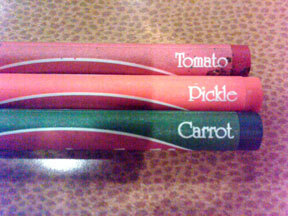 And how the color descriptions on the side of the crayon are supposed to be colors of the food that they serve? I would not recommend eating the carrots at Jason's Deli, and I'm a little worried about the pickles, too.